What are the most popular online bachelor's degrees offered in Vermont? Vermont is one of six states that comprise the New England Board of Higher Education (NEBHE), an educational collaborative that offers a variety of benefits to New England residents who want to pursue online learning. NEBHE's tuition break program, for example, allows students to enroll at out-of-state public colleges and universities for discounted tuition rates, and it has saved residents billions of dollars since its launch in 1957. Residents of Vermont who want to pursue higher education online also have access to the Vermont Virtual Learning Cooperative (VTVLC), which connects students with schools across the state. Students who want to take courses that their own school does not offer can go through VTVLC to find an online version of the course at another school and enroll in it. All of the courses in the VTVLC database are accessible from anywhere at anytime, giving students the opportunity to pursue a passion while pursuing their degree. Students who enroll in courses at accredited online colleges in Vermont have all the advantages of those who attend classes on campus, as well as a few additional benefits. For example, distance learners have the flexibility to work full-time while pursuing a degree, and they often save money in the process because they don't have to pay for housing or transportation costs to commute. There are several ways that distance learners can save on tuition costs, too, making it a highly lucrative way to pursue a college degree. The University of Vermont (UVM), among the oldest colleges in the nation, is home to approximately 12,100 students from 48 states and overseas. The school has more than 100 majors administered by seven undergraduate schools and colleges, 50 master's, 22 doctoral degree programs, and a medical school. As an online colleges in Vermont, UVM offers elearning at the undergraduate and graduate programming in areas as diverse as farmer training, ecological economics, cyber security, and medical school preparation. Bachelor's degrees are offered 100% online in nursing and health sciences. The RN to BSN program allows registered nurses to complete a baccalaureate degree online. The online bachelor's degree in health sciences integrates social, behavioral, and analytical areas of the field; it is designed for working adults with at least one year of college or an associate degree who want to pursue non-clinical careers. All online courses are accessible 24/7 via Blackboard. One of Vermont's online colleges, Champlain's bachelor's degrees are offered 100% online in areas such as accounting, business management, software development, and healthcare administration. A program of note is the nationally recognized BS in Economic Crime Investigation, a degree that blends the fields of accounting, criminal justice, and computer forensics in developing qualified fraud investigators. The BS in Computer Forensics and Digital Investigations is a similar Champlain program from the institution's renowned Leahy Center for Digital Investigation. At Champlain College, the online learner experience involves high-quality programs and instructors, ample opportunities for interaction between students and faculty, 24/7 access to courses, and small classes for individual attention. Students enrolled at Norwich University have access to academically rigorous programming emphasizing interactive classes, mentorship between students and faculty, and extensive opportunities for hands-on learning. One of the best online colleges in Vermont, Norwich offers six bachelor's degree completion programs designed for busy working adults. The degrees can be earned 100% online in the fields of interdisciplinary studies, criminal justice, cyber security, management system, national security studies, and strategic studies and defense analysis. Of note is the the BS in Strategic Studies and Defense Analysis -- designed for active duty, Reserve and National Guard soldiers, airmen, sailors, and Marines -- which builds on military personnel's education and experience. They can complete the degree in two years by transferring up to 90 semester credits into the program. All online students have various support resources at Norwich, including free books mailed to them, student services advisors, a virtual library, and technical support team. Located in Poultney, Green Mountain College is considered to be one of the best online schools in Vermont. The university offers two bachelor’s programs completely online: a bachelor of science in business administration and a bachelor of arts in interdisciplinary studies. Courses are delivered asynchronously, allowing students to complete their assignments at their own pace. The program is designed for students who have already completed at least 24 undergraduate credits. Applicants must have a minimum GPA of 2.5 and submit an application and all previous transcripts. 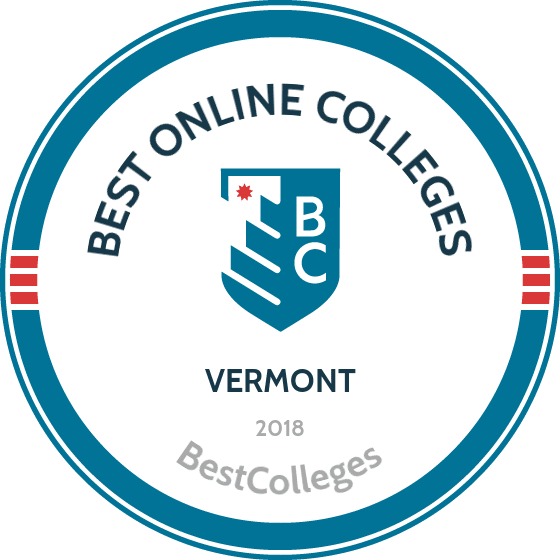 Founded in 1828, Johnson State College is a prestigious public liberal arts college that offers students the chance to receive an education from one of the top online colleges in Vermont. The online programs feature nine start dates throughout the year and are offered in seven- or 14-week formats. Online students are taught by the same instructors that teach on-campus students, and coursework is delivered asynchronously. Out-of-state, online students are eligible for scholarships and pay in-state tuition. JSC offers five bachelor’s programs online: wellness and alternative medicine, professional studies, interdisciplinary studies, psychology, and business. Online learners have access to advisers that help them find the best program that will help them reach their professional goals. Vermont is small both in size and number of post-secondary institutions ― one of the ten states in the U.S. with less than 30 Title IV schools. However, the majority of these colleges and universities in the state offer online programs, and the state boasts an impressive 46.5% graduation rate ― one of the highest in the nation. Additionally, two of Vermont's colleges are ranked as highly competitive, according to a recent NY times article. It is also considered one of the safest places to live in the nation, so those choosing to pursue residency can be assured of low crime rates across the state. A recent NCES report (2012) showed that 4,507 students, or 10%, of those enrolled in Title IV schools in Vermont were pursuing a degree through an exclusively-online program. Although Vermont's appropriation of funds for higher education is low by national standards, the state legislature made a recent proposal to increase such funding, specifically to assist lower-income families with tuition and other associated costs, and decrease overall college debt for state residents. For now, students can seek assistance and financial aid through the Vermont Student Assistance Corporation, which is dedicated to helping bring resources to all who desire a post-secondary education. Employment growth in this profession is moderate in Vermont. According to the Vermont Department of Labor, long term projections show an increase of 12% in the total number of jobs between 2014 and 2024. Wages increased by 7% from 2011-2016. In 2016, what were the top careers in Vermont for people who had a degree in management information systems? Data source: Vermont Department of Labor, Bureau of Labor Statistics. Data may not be available for every year. Employment growth in this profession is moderate in Vermont. According to the Vermont Department of Labor, long term projections show an increase of 7% in the total number of jobs between 2014 and 2024. Wages increased by 7% from 2011-2016. In 2016, what were the top careers in Vermont for people who had a degree in business administration and management? Employment growth in this profession is moderate in Vermont. According to the Vermont Department of Labor, long term projections show an increase of 13% in the total number of jobs between 2014 and 2024. Wages increased by 7% from 2011-2016. In 2016, what were the top careers in Vermont for people who had a degree in registered nursing? Employment growth in this profession is strong in Vermont. According to the Vermont Department of Labor, long term projections show an increase of 23% in the total number of jobs between 2014 and 2024. Wages increased by 16% from 2011-2016. In 2016, what were the top careers in Vermont for people who had a degree in computer programming/programmer? Employment growth in this profession is strong in Vermont. According to the Vermont Department of Labor, long term projections show an increase of 33% in the total number of jobs between 2014 and 2024. Wages increased by 9% from 2011-2016. In 2016, what were the top careers in Vermont for people who had a degree in marketing/marketing management? No schools in Vermont currently offer an online degree program in marketing or marketing management.